Parabuthus transvaalicus is one of the biggest scorpions in the family Buthidae, growing up to 140 mm in length. It is dark brown to black in colour and has a thick tail and thin pincers. Thick-tailed or fat-tailed scorpions generally have potent venom and P. transvaalicus is considered to be one of the most poisonous scorpions in southern Africa. Its venom is neurotoxic and can be fatal to humans if left untreated. Children are more susceptible to the venom than adults. The venom can cause an allergic reaction, which, if extreme enough, might cause the victim to go into anaphylactic shock that can be fatal if not treated immediately. Parabuthus transvaalicus is able to produce a sound by scraping the sting across the ridges on the dorsal surface, an act known as stridulation and which is normally used as a warning sign to intruders. Parabuthus transvaalicus is ground dwelling and burrows in sand, shrubs, under rocks and logs. It is known to occur in South Africa, Zimbabwe, Swaziland, Mozambique and Botswana. All scorpions have basically the same form, which is easily identifiable. They all have an exoskeleton made of chitin. Their bodies are divided into three main parts: the prosoma, mesosoma and metasoma (Leeming 2003). The prosoma is the combined head and thoracic region (also called a cephalothorax) and is covered and protected by shield-like plates called the carapace. 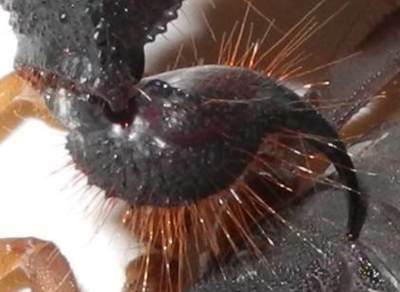 There are eight simple eyes on the top surface of the prosoma, and underneath are a pair of pedipalps or pincers, four pairs of walking legs, and pectines, which are a pair of comb- or wing-like chemosensory structures that brush the substrate as the scorpion walks. The mesosoma, also called the opisthosoma, is the abdominal region of the scorpion and is protected underneath by five shield-like plates called sternites, which can be used for species identification and on top by seven plates called tergites. Sternites have openings for breathing called spiracles. The metasoma is the tail region of the scorpion and is made up of five segments, each of which is progressively longer than the preceding one, and the sting (telson) is located on the last segment. Venom is stored in the sting, and during stinging, the muscles around the sting contract to squeeze out venom through the sharp tip (the aculeus). The sting can also be used for tasks such as burrowing and to produce sound. The genus Parabuthus includes some of the largest scorpions, which are between 40 mm and 140 mm in length. They can be recognised by their small pincers and thick tails. Parabuthus transvaalicus is one of the biggest scorpions in the family Buthidae, growing up to 140 mm long. It is dark brown to black in colour and has hair on some parts of its body (Larsen 2005). Parabuthus transvaalicus is able to stridulate—produce sound—by repeatedly scraping the sting across the ridges on the dorsal surface of the body (Prendini & Esposito 2010). Younglings resemble the adults at birth but are pale and under-developed (Leemings 2003). They have no exoskeleton, which only develops after the first moult, when the young scorpions attain an adult-like shape with a better and stronger exoskeleton. At this stage the young leave their mother and disperse. Parabuthus transvaalicus has four short, stout legs with strong claws that are well adapted to living in sandy terrain and to its burrowing behaviour (Larsen 2005). Parabuthus transvaalicus prefers living in burrows, under rocks, logs or shrubs. Scorpions are solitary animals (Leeming 2003) and communication between individuals is minimal. There is some form of communication through behaviour. This includes a dance during mating and a defensive posture when threatened. Parabuthus species also have the ability to produce sound by rubbing together certain body parts; an act known as stridulating, which is normally used as a warning sign to intruders. Parabuthus transvaalicus occurs in South Africa, Zimbabwe, Swaziland, Mozambique and Botswana (Leeming 2003). In South Africa, it is found in Gauteng, KwaZulu-Natal and Limpopo Province (ARC 1997; Leeming 2003). Parabuthus transvaalicus is usually found in areas of low rainfall where they are ground-dwelling and dig shallow burrows at bases of shrubs, under rocks, under logs or any suitable structure (Larsen 2005). Scorpions, including P. transvaalicus, are predators that generally eat anything they can overpower. This includes insects, spiders, other scorpions, earthworms, gastropods, as well as small reptiles, mammals and amphibians. Scorpions reproduce sexually (Lourenço 2000). Males actively roam around looking for females during the mating season, which coincides with the warmer months of the year (Leeming 2003). When the female is located, the male sends messages to the female through vibrations (produced by tapping the ground with his pincers), letting her know of his intentions. After the female responds positively the male grasps the female’s pincers with his pincers and they sometimes even lock mouth parts. The female is then directed to a smooth hard substrate, like a rock, in a dance that could last for up to 30 minutes. When the right substrate has been found, the male deposits his spermatophore (package full of reproductive cells) on the substrate. He then positions the female in such a way that her genital opening is aligned with the spermatophore, which the female then takes up. At this point, if the male doesn’t get away quick enough, he may be eaten by the female. Depending on the species, pregnancy is between a few and 18 months in duration (Leeming 2003). Most scorpions give birth to live younglings. The younglings stay with their mother for the first couple of weeks, until the first moult, at which time the female may aggressively protect her young. Most younglings disperse after the first moult, and depending on the species, go through between four and seven moults before reaching adulthood (Wikipedia 2013). Scorpions generally have a life span of about four to 25 years (Lourenço 2000). Scorpions are generally solitary animals. They live by themselves. The only time scorpions display social behaviour is during mating and when the female takes care of her young. Scorpions, including P. transvaalicus, are an important part of an ecosystem. In some areas where food is scarce, such as in deserts, they are an important food source for other animals. Animals that have been found to include scorpions in their diet are hornbills, owls, frogs, snakes, some bats, larger reptiles, larger centipedes, solifugids, spiders, honey badgers, suricats, bat-eared foxes, selous’ mongooses, Cape foxes and yellow mongooses (Leemings 2003). 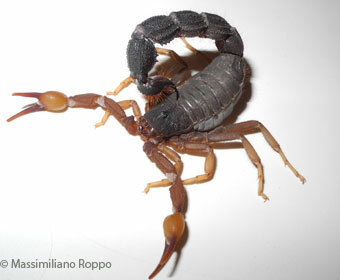 The list is not exhaustive and there are many other animals that are known to feed on scorpions. Scorpions are fascinating animals. They have retained their primitive forms and some of their behaviours (Leeming 2003). This opens up a window to the past and provides a glimpse of how scorpions lived, where they lived, adaptations and survival mechanisms. Scorpions are also an important source of food for other animals. Because scorpions mostly feed on invertebrates, they can be seen as playing a part in keeping invertebrates in check, especially invasive species or vectors of disease. For a long time scorpions have been associated with evil and witchcraft culturally. Even today many people are still afraid of scorpions. Scorpions are also believed to be suicidal by stinging themselves when surrounded by fire. This is untrue, as most scorpions are immune to their own poison. When surrounded by fire they become disoriented and whip their tail around and may end up stinging themselves. The self-inflicted sting will not kill the scorpion, but the heat might, leading to the popular misconception that the scorpion stung itself to death (Leeming 2003). It is believed in African culture that if you are stung by a scorpion, you should find the scorpion that stung you and kill it by rubbing it against the area where it stung you and you’ll get better. Parabuthus transvaalicus has a thick tail and small pincers. Thick-tailed scorpions generally have more potent venom than thin-tailed ones. The complex neurotoxic venom has the potential to kill a human if untreated, especially children, who are more susceptible to the venom (Elston 2005). The venom can also cause an allergic reaction, which, if extreme enough, might cause the victim to go into anaphylactic shock that can be fatal if not treated immediately. Currently no scorpions in South Africa, including P. transvaalicus, are formally protected or assessed at a national level (IUCN Red List 2013). The threat status of scorpions is therefore currently unknown. This means that impacts on scorpions by mining, agriculture, land developments and collection for the pet trade may be severe but undocumented. This lack of information constrains the planning and implementation of conservation plans for scorpions. The lack of information can be rectified by regular monitoring programmes such as iSpot, where the general public can assist in gathering information about scorpions by taking and uploading pictures and recording information like location and habitat. Users of the iSpot website assist with identification and information and photographs are stored on the website. The resulting species information database can then be used to provide data for use in planning and conservation activities. The genus Parabuthus has 28 species spread throughout Africa and the Middle East (Prendini 2000), of which 20 species are known to occur in southern Africa (Leeming 2003). The closest related species to P. transvaalicus is P. villosus, the black hairy thick-tailed scorpion, which is also known to occur in southern Africa (Prendini 2004). ARC, 1997. African Arachnida Database (AFRAD). http://www.arc.agric.za/afrad/afradmain.aspx. [Accessed 14 August 2013]. Elston, D.M. 2005. What’s eating you? The South African fattail scorpion (Parabuthus transvaalicus). http://www.cutis.com/fileadmin/qhi_archive/ArticlePDF/CT/076050299.pdf. [Accessed 18 February 2014]. IUCN, 2013. The IUCN Red List of Threatened Species. http://www.iucnredlist.org/search. [Accessed 8 August 2013]. Larsen, N. 2005. Parabuthus (burrowing thick-tailed scorpion). http://www.biodiversityexplorer.org/arachnids/scorpions/buthidae/parabuthus.htm. [Accessed 17 August 2013]. Leeming, J. 2003. Scorpions of southern Africa. Struik, Cape Town. Lourenço, W.R. 2000. Reproduction in scorpions, with special reference to parthenogenesis. European Arachnology 19: 71–85. Prendini, L. 2000. Phylogeny of Parabuthus (Scorpiones, Buthidae). Zoological Scripta 30: 13–35. Prendini, L. 2004. The systematics of southern African Parabuthus Pocock (Scorpiones, Buthidae): revisions to the taxonomy and key to the species. The Journal of Arachnology 32: 109–186. Prendini, L. & Esposito, L.A. 2010. A reanalysis of Parabuthus (Scorpiones: Buthidae) phylogeny with descriptions of two new Parabuthus species endemic to the Central Namib gravel plains, Namibia. Zoological Journal of the Linnean Society 159: 673–710. Wikipedia, 2013. Scorpion. http://en.wikipedia.org/wiki/Scorpion. [Accessed 9 August 2013].